Adventure is in Tory Brennan's blood. After all, she’s the grandniece of world-famous forensic anthropologist Temperance Brennan. Always up for a challenge, Tory and her science-geek friends spend their time exploring the marshlands of Loggerhead Island, home to the very off-limits Loggerhead Island Research Institute, where something strange is going on. After rescuing a stray wolfdog pup from a top-secret lab, Tory and her friends are exposed to a rare strain of canine parvovirus, changing them--and their DNA--forever. Now they are more than friends. They are a pack. They are Virals. And they're dangerous to the core. But are they unstoppable enough to catch a cold-blooded murderer? Kathy Reichs (www.kathyreichs.com), like her iconic character Dr. Temperance Brennan, is a board-certified forensic anthropologist, and creator of the Fox television hit Bones, now in its eighth season. Reichs has written fourteen books in the Temperance Brennan series, all New York Times bestsellers. 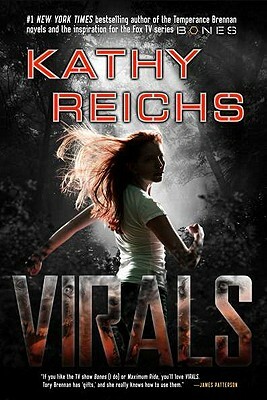 Virals is her first of three novel for young readers (www.viralstheseries.com).